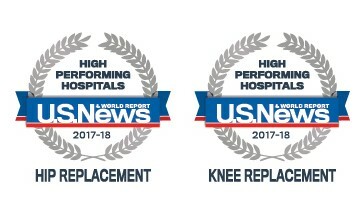 U.S. News & World Report named Saint Francis Medical Center a “High Performing Hospital” for both hip replacement and knee replacement, the only hospital in the region recognized with this designation. To earn this prestigious honor, Saint Francis’ Center for Joint Replacement & Revision performed significantly higher than the national average in three key areas for both joint replacement procedures. To learn more about this Orthopedic Institute honor, call 573-331-3996.